A 2018 video update from the author of how the trading systems have performed since the release of this book with NinjaTrader and MultiCharts code now available. 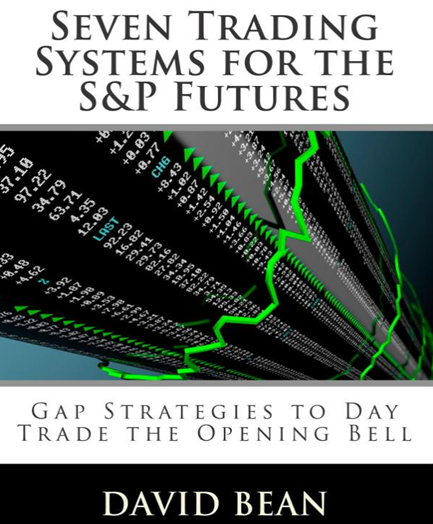 https://capstonetradingsystems.com/products/seven-trading-systems-for-the-s-p-futures-e-book Discover seven new trading strategies for the S&P futures. If you are a beginner or advanced, trading the daily open can be one of the best ways to trade the market. We specifically cover the rules on how to systematically day-trade the E-mini S&P 500 futures. Learn how to distinguish between four different gap trading setups and how to trade a Gap Fill or Gap Continuation. Learn how to combine two strategies into one. Understand the PT/SL Ratio. Learn how to exit a trade with graphical analysis techniques. Discovering both the art and science of trading as well as the secret behind optimization. Use this book to further develop your own strategies to trade the daily open in any market. The rules and Tradestation EasyLanguage code are completely disclosed for all seven systems so that the strategies can be fully automated or traded manually.